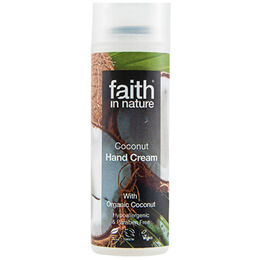 With an amazing tropical aroma, the Coconut Hand Cream is specially formulated to quickly absorb with no greasy residue, leaving your hands feeling soft and supple. Made with organic coconut to enrich your senses. Aqua (Water), Caprylic/capric triglyceride*, Cocos nucifera (coconut) oil**, Glycerin*, Cetearyl olivate*,, Cetearyl wheat straw glycosides*ºº, Sorbitan olivate*, Cetearyl alcohol*, Helianthus annuus (sunflower) seed oil**, Butyrospermum parkii (shea) butter***, Tocopherol*, Parfum*, Glyceryl stearate*, Stearic acid*, Xanthan gum*, Sodium benzoate, Potassium sorbate, Citric acid*, Benzyl alcohol. ºº Wheat straw sugar derived, gluten and protein free. Apply hand cream liberally to your hands, especially after household chores. Helps dry, cracked and rough hands. For maximum benefit, use daily. 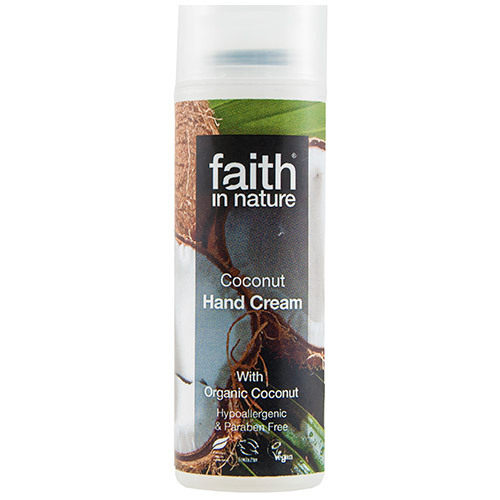 Below are reviews of Faith in Nature Coconut Hand Cream - 50ml by bodykind customers. If you have tried this product we'd love to hear what you think so please leave a review. Love the smell, love the pump dispenser. Absorbs nicely.